I am of the ‘I need eight hours shuteye a night’ tribe. I am awestruck when I read about folk who regularly survive on four hours sleep or less, betwixt dusk and dawn and still manage to fully function as entirely sane human beings. How do they do it? The past few weeks through a combination of getting up earlier some mornings or going to bed later some evenings, my average number of hours sleep per day, has dipped below the magic number eight. I don’t keep a sleep spreadsheet; I just know there is a deficit. To catch up on some of the lost hours I am going to bed early tonight. Usually I have no problem sleeping but when I go to bed early, my brain becomes confused and slumber eludes me. Recently I have discovered how to get to sleep when this happens. Here’s what I do; I breathe in deeply, right into my diaphragm, (to check if you are doing this correctly, put your hand on your tummy and if your tummy rises as you breathe in, you are breathing into your diaphragm) I then exhale slowly. I am usually asleep before I get to twenty breaths. Methinks it’s easier than counting sheep! I am not suggesting it’s a universal cure for insomnia but it works for me. 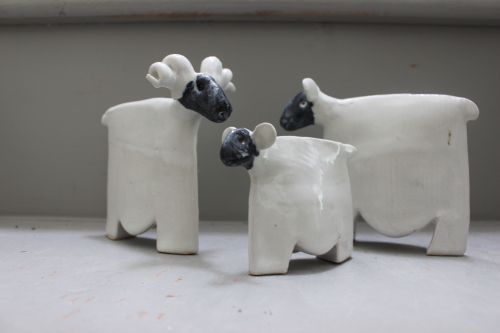 Note; thanks to Geoffrey Healy of Geoffrey Healy Pottery (http://www.healy-pottery.com) who kindly allowed me to take the picture you see above of pottery sheep at his gallery.